The Serbian war crimes court acquitted two former Serb policemen Tuesday of collaborating in the execution-style slaying of three Albanian-American brothers in 1999. The former policemen were accused of torture and other crimes while handing over the three brothers — Illy, Mehmet and Agron Bytyqi — to members of a special Serbian police unit who shot and killed them in a training camp in eastern Serbia. “After questioning about 50 witnesses and experts, we have come to the conclusion that there is no evidence that they had committed crimes,” said Vesko Krstajic, the head of the three-judge panel. Serbia’s war crimes prosecutor’s office said in a statement later Tuesday that it would appeal the acquittal of Sreten Popovic and Milos Stojanovic, insisting that “the accused and the witnesses…concealed the truth” during the trial about their participation in the killings. What makes the [Albanian Joseph DioGuardi] PAC and individual contributions to campaigns more interesting is the demonstrated connection between the Kosovo Heroin Mafia, its “pizza connection” distribution (”inherited” from the Gambino crime family) and money-laundering networks, and the number of pizzaria owner-contributors listed in DioGuardi’s filings. The Croats and Albanians came up with big pots of laundered money, then spread it around selectively, with American politicians helping to persuade other members in Congress. The Bytyqis joined the Atlantic Brigade of about 400 Albanian-Americans fighting with the rebels. After NATO bombed Serbia to stop its crackdown on the rebels, the brothers strayed outside Kosovo’s unmarked boundary. On June 26, 1999, they were arrested in southern Serbia. They spent 15 days in a Serb jail for illegally crossing the border. Upon their release, they were taken by the two Serb policemen to eastern Serbia, where they were summarily executed. No one has been charged with the shooting itself. Members of the former special police unit allegedly involved have refused to reveal any details or names of possible culprits. A lawyer for the brothers’ families quit the trial earlier this year, claiming authorities are protecting those who ordered the killings. As I explained before about this: In case anyone is tempted to moral outrage on behalf of the three dead brothers, be advised that if three al-Qaeda operatives had snuck into the U.S. to murder American police officers or otherwise attack the United States, and a judge only gave them two weeks in jail for improper border passage, it’s not difficult to imagine a scenario in which members of the police force might take the law into their own hands (or stand aside while someone else did), especially if the brothers were part of a group of known cop-killers like the KLA. The Bytyqis, like others infiltrating Serbia through Albania, snuck into a country to join a terrorist group and attack that country. 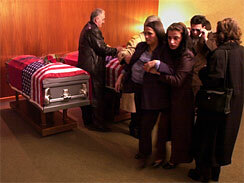 Left: Bahrije Bytyqi (center) is assisted by her daughter-in-law Valbone Bytyqi (third from right), after she visits the caskets of her three sons before their funeral services in Yonkers, New York, March 4, 2002. The remains of Ylli, Agron and Mehmet Bytyqi, who fought with the Kosovo Liberation Army in their parents’ homeland of Kosovo, were exhumed from a mass grave in the town of Petrovo Selo in Serbia. The U.S. Embassy remains concerned that to date no one has been convicted for the 1999 killings of U.S. citizens Agron, Ylli, and Mehmet Bytyqi. We understand that the Serbian War Crimes Prosecutor plans to appeal the acquittals that were announced on September 22. We hope that prosecutors will aggressively pursue any leads on this case. We expect Serbian authorities to bring to justice those responsible for the deaths of Agron, Ylli, and Mehmet Bytyqi. That’s right — we expect Serbia to come down hard on killers of Serb-killers!